If you want to subject your visitors to quizzes or personality tests, then this WordPress plugin is what you’ve been looking for! WordPress Quiz Plugin is a platform for any kind of quiz. 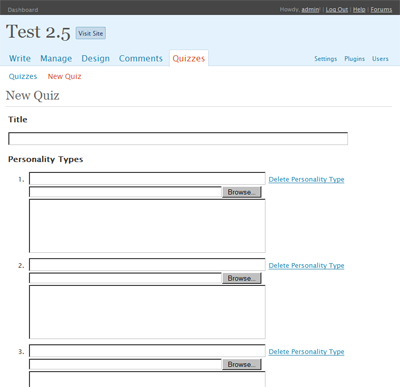 The plugin currently comes with only quiz type: the personality quiz, but if you have other quiz needs it’s easily adapted. In fact, if you’d like to contribute other quiz types, we’ll add them to the distribution. Suitably convinced? Then Download the plugin! Upload the wordpress-quiz-plugin directory and the files within it to your wp-content/plugins directory. Got a bug to report? Or an enhancement to recommend? Or perhaps even some code to submit for inclusion in the next release? Great! Share your feedback in the comments below. Looks good! Can you give the url of a site using the quiz? Really looks great, but I have a question. Is there any other support for this plugin? I can see how you add personalities and questions, but how do you assign a score to each answer, and in turn generate the appropriate answer for their score? Quiz Fanatic (http://www.quizfanatic.com/) is currently using this plugin. Is it possible to display the correct answers? I plan to use it for an exam site. 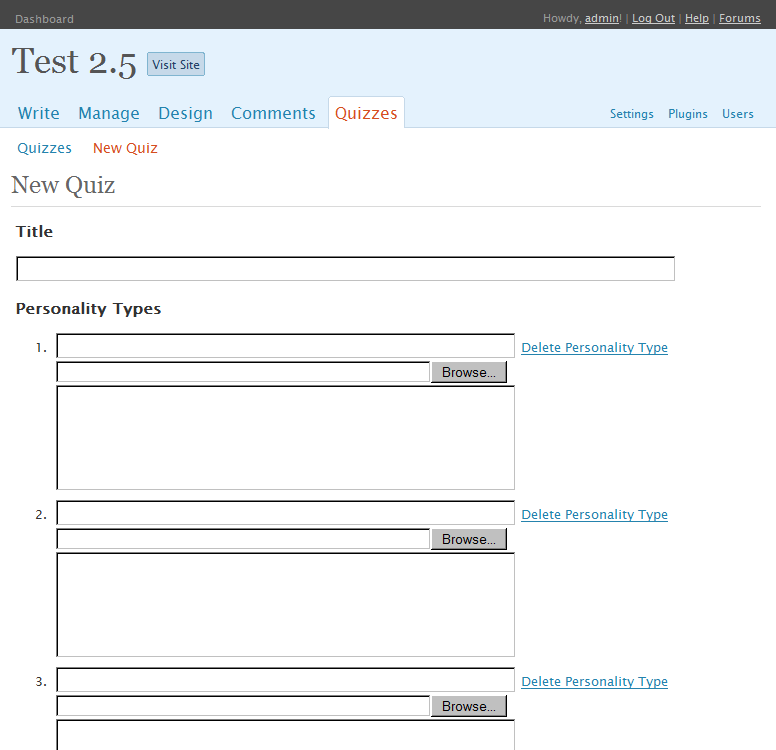 Right now the only quiz that comes with the plugin is a personality quiz. There are no correct or incorrect answers. They just show you which personality type you matched the most number of answers with. Realy great but i have a question : Do you have a technical suport ? I have installed this Quiz but I am not able to use it. Give exact usage instruction ..
Hello, I am Brazilian and not write the English right..sorry! Where do I find other types of questions for this quiz? Someone know where I find? Right now the only type available is the personality type. Ideally there will be more added in the future. Great tool, but I’m finding that my answer options are not lined up, with empty choices (I only have three answer choices per question) before and/or after the real ones. No particular pattern. Any suggestions? It looks good but how do you set the correct answers? is there any instruction? Thanks anyway. This quiz is exactly what I need except it requires that you have as many multiple choice answers as there are possible results. Is there a way to eliminate empty fields? Right now there isn’t a way of doing that. However that’s a good idea and I’ll put it into the next version of the plugin. I want to weight the answers so some questions count much more than others. Is there a way to do this? hi, i’d love to use this plugin, it’s great – thanks! – but i don’t want the html “share this quiz” bit to appear at the end, could you tell me where to remove it in the plugin files?